than one miles, up Thorofare Ridge. 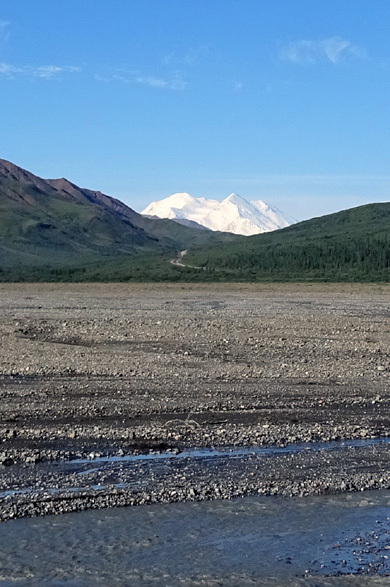 The views are particularly impressive on clear days!" 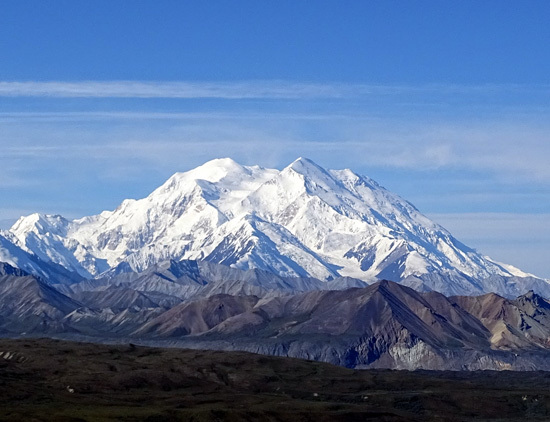 I can vouch for the impressive, panoramic views from Thorofare Ridge on clear or mostly-clear days when it feels like you can reach out and touch Denali, "The High One." 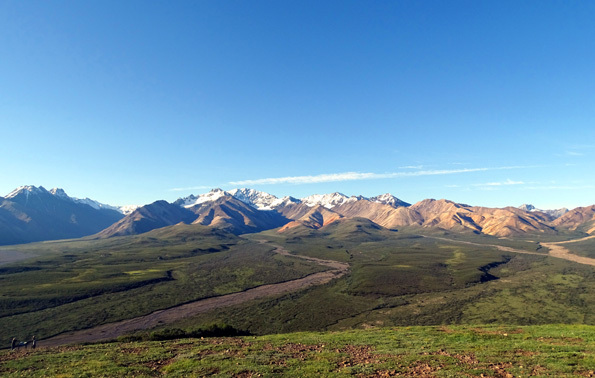 I was just waiting for a sunny day to do this hike again, my fourth time up the ridge across from the Eielson Visitor Center at Mile 66 on the park road. 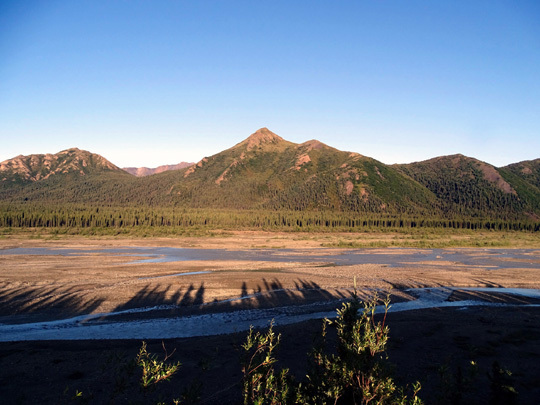 I enjoyed the views so much the three times I climbed up and explored the ridge in 2012 that I was eager to do it again on this year's trip to Alaska. And I did! 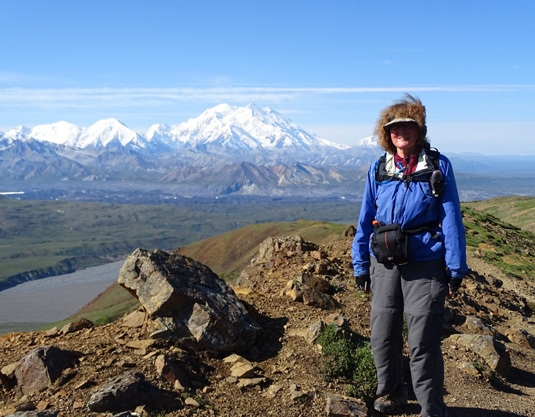 This is me on top of the ridge today, with Denali in the background. 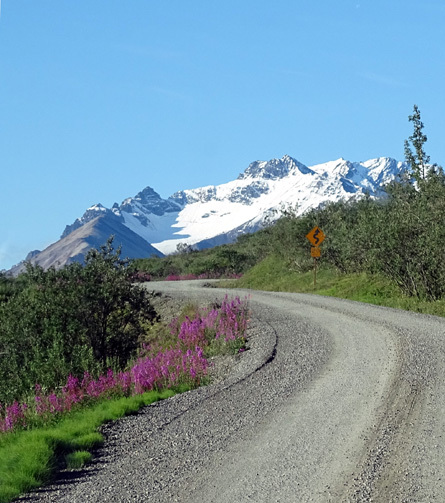 This morning's clear weather was perfect for my shuttle bus ride, this alpine hike, and Jim's bike ride out from Tek to Sable Pass. 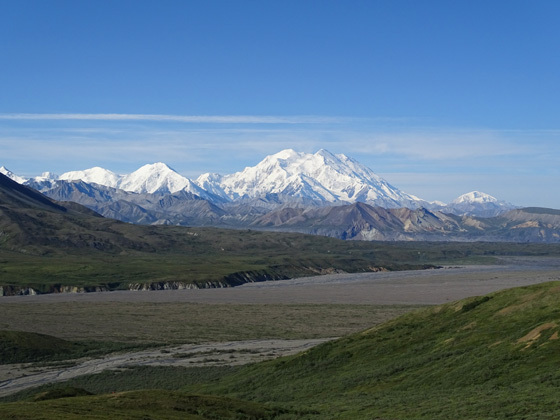 We both had marvelous views of Denali until about 1 PM, when the inevitable afternoon clouds gathered around Denali and nearby peaks. That made my second hike less impressive at Wonder Lake in the afternoon but it was still fun to walk somewhere new. Because of the fantastic weather this morning, I took tons of photos and Jim even took some on his bike ride. 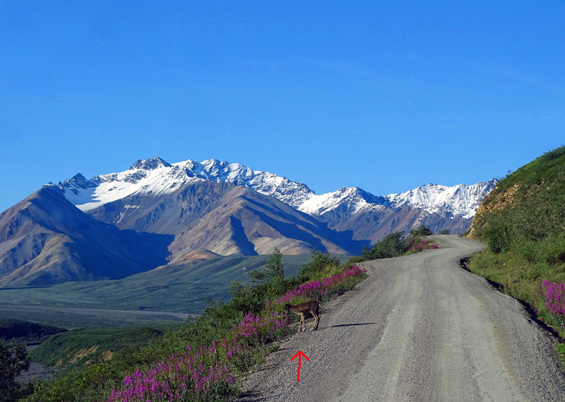 Most of them are better than the pics I shared in yesterday's entry so this four-page entry contains more pages to showcase the beautiful sunny views we saw. 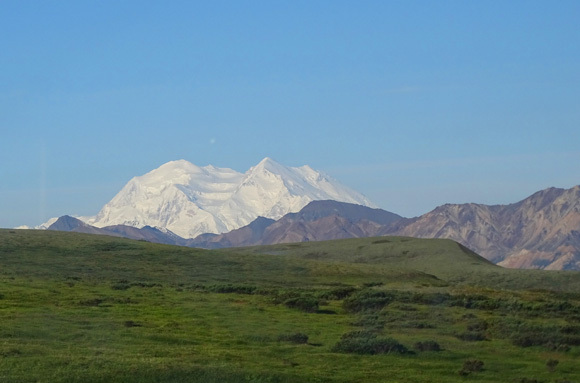 Many visitors never get a good view of Denali because it's completely or partially hidden under clouds. This is what they're missing! We knew today was supposed to be mostly sunny so Jim and I planned our activities accordingly. 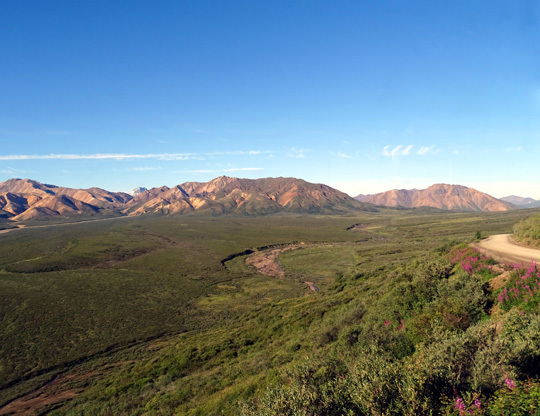 My goal was to get out to Eielson (Mile 66) early enough to hike up the ridge, wander around, and get back down before Tim's Kantishna bus arrived about 12:30. 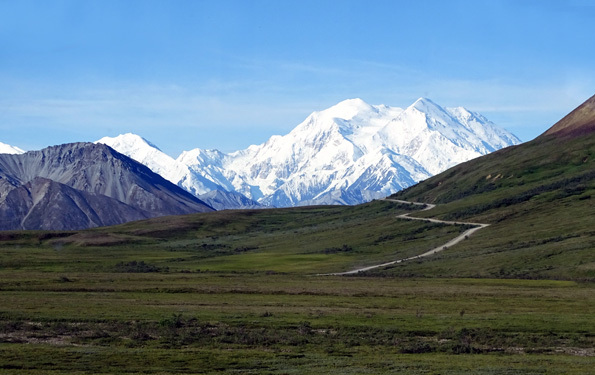 If the mountain was still visible then, I wanted to ride out another 20+ miles on his bus to the north end of Wonder Lake (about Mile 88) and do some hiking there before he came back from Kantishna at Mile 92. This was my first of two "free" Tek Pass rides on the shuttle buses. 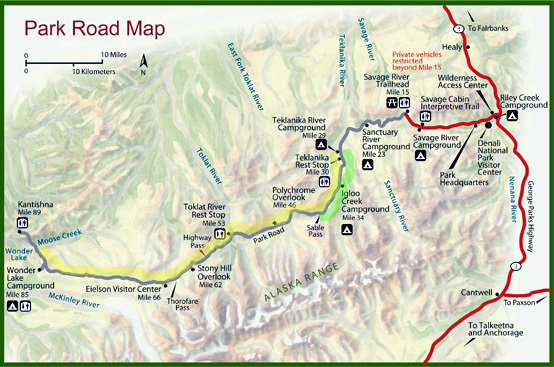 I explained in an earlier entry this terrific perk for folks staying at the Teklanika AKA "Tek" River Campground -- pay for one bus ride between Miles 29 and 92 in the park, then get subsequent rides at no extra cost on a space-available basis for as long as they have a reservation at Tek. We're at Tek three full days = three bus rides for each of us (Jim opted out). If folks stay longer, they can do more "free" rides. What a deal! 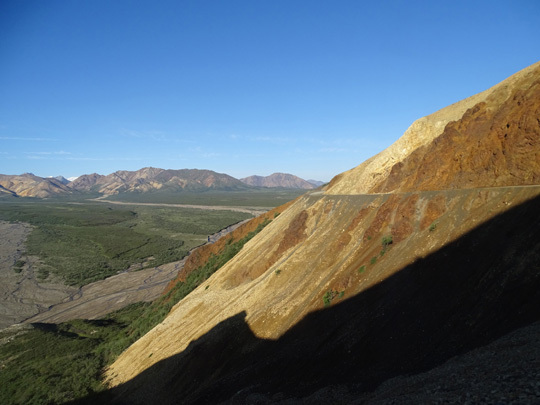 Yesterday I used my original Tek Pass reservation to go all the way to the end of the park road to Kantishna, an old mining community, at Mile 92. Today I could ride any shuttle bus outbound from Tek for as far as I wanted as long as it had room for me when it got to Tek this morning. I got ready early and went out to the bus stop at the campground entrance. I was able to get on the first Eielson bus at 7:10 AM. 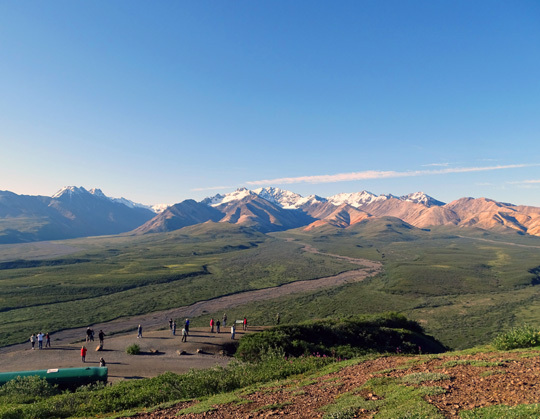 I knew I'd have a decent chance of catching one of the early Eielson buses because there are more shuttles going there from the park entrance than any other destination, and many folks aren't keen on boarding at the park entrance as early as the first buses leave (about 6 AM). 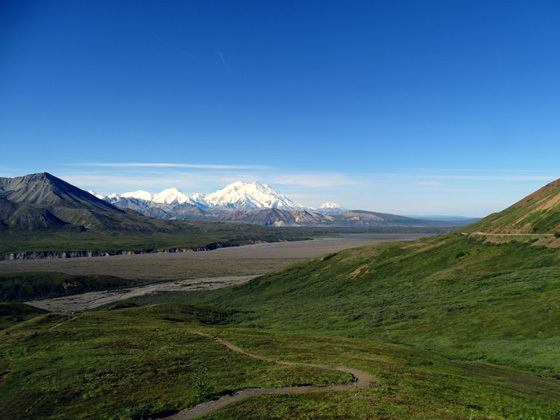 from the hill above the rest stop; bus drivers allow time to take a quick hike up this trail. There were a few seats left, including the aisle seat in the second row behind the driver. I like being near the front so I asked the smiling young woman sitting by the window if I could join her. 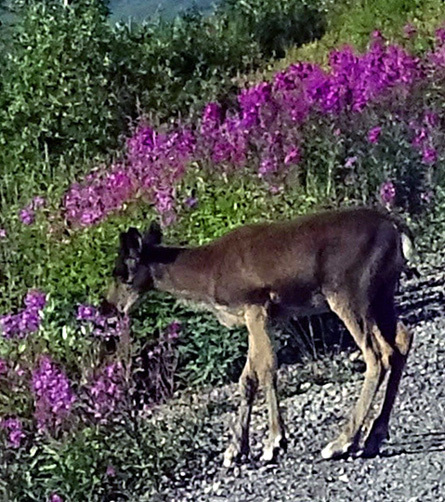 She's from northern MN and asked me lots of questions about hiking off-trail in the tundra after I told her about the interesting Discovery Hike I did several days ago. 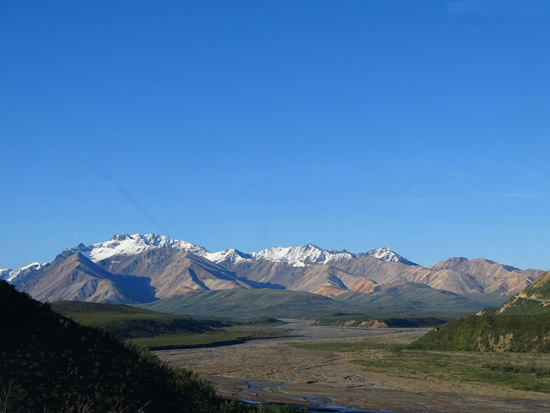 in these shots -- while the bus was moving -- between the Polychrome and Toklat rest stops. 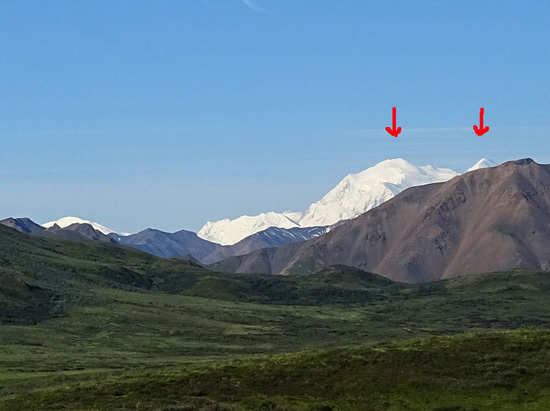 near the Toklat rest area; the configuration of the two peaks is very recognizable. 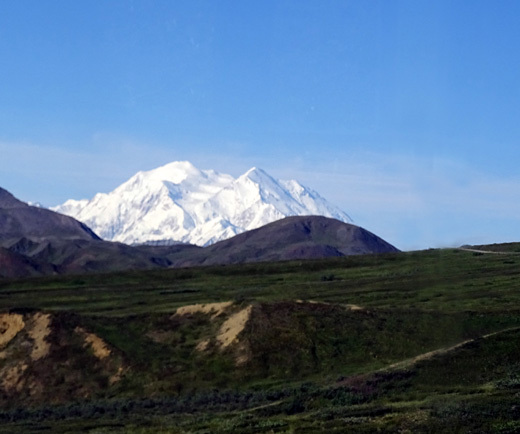 One of the best views of Denali is from Stony Hill, a few miles east of Eielson. 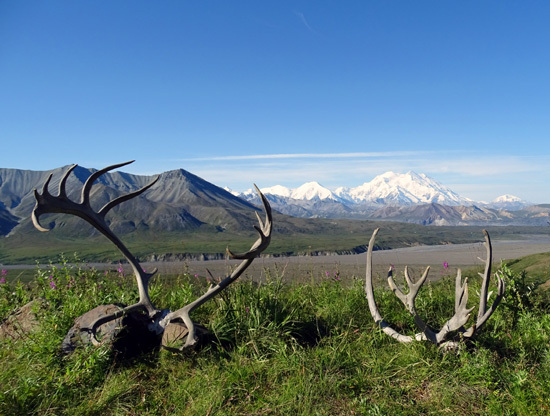 That's where I got my favorite shots of the mountain three years ago, including the photo that heads every page of this year's journal. 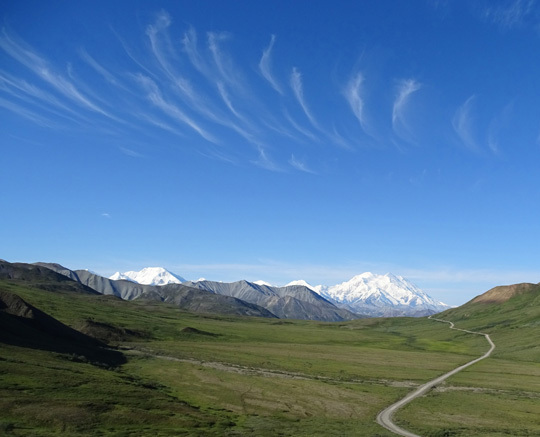 The wispy, vertical clouds look like exclamation points to the wonder of Denali. The 2015 photo at the top of this page that I took three years ago is still my favorite, though. 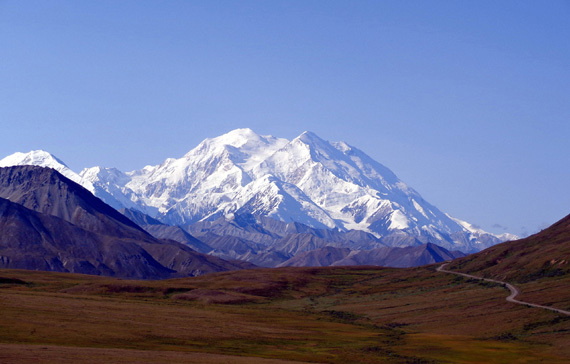 Dontcha just want to get out there and climb that thing?? I do! 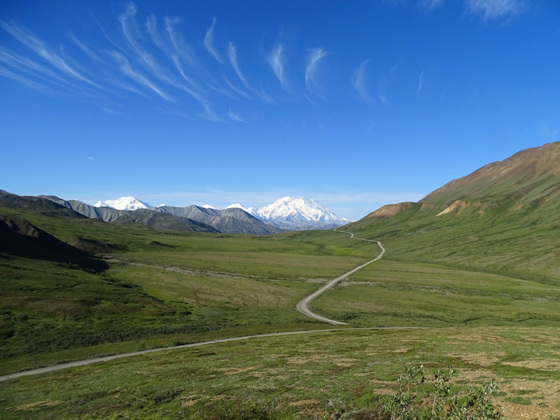 If you're visiting Denali NP and want to maximize your chances of seeing Denali when it's "out" (i.e., visible), take one of the early buses. 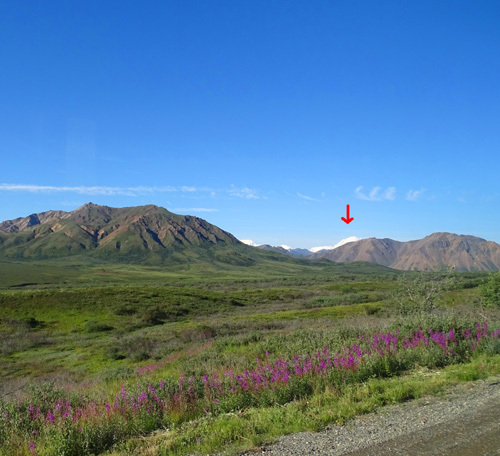 Don't get too discouraged if it's cloudy or raining near the entrance; it may well be sunny 66 miles into the park. Like other mountainous regions in North America, the weather is very localized here.